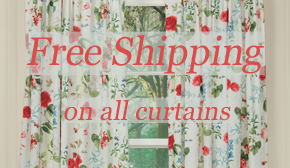 When we think summer decorating, we think of light and airy, sheer fabrics that will keep the look of our living spaces feeling cool. So you may be unsure of what a material like hooked wool, would do for the decor of your home environment. But not to worry, because hand hooked 100% wool will only add beauty and a touch of homespun fun this summer. As you will see below on Sturbridge Yankee Workshop’s exclusive pillows, wool is a fabric that adds depth and texture to a design. Hooking allows for details to be shown in the design that may not otherwise be seen if it was printed onto or woven into the pillow. 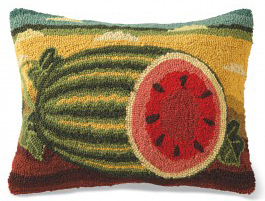 Add a burst of summer decor on an entryway bench, a favorite chair or even your bed with our Watermelon Hooked Wool Pillow. Pictured here to the left, this delightful pillow is designed by artist Diane Ulmer Pederson. Nothing says summertime like fresh, juicy watermelon. It’s a sunny day on the farm and this green and pink fruit almost looks good enough to eat. The watermelon is still attached to the vine, but has been sliced open so we can see the circle of black seeds. The shaded color palette in this pillow is achieved through use of the hand-hooking technique. Hooked pillows like this one also make for great gift giving ideas. Another summer pillow option is our beautiful Hydrangea Pillow, seen here to the left. 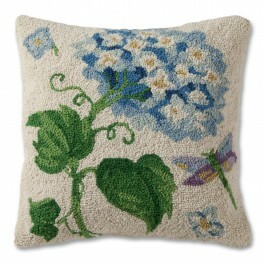 A pretty blooming hydrangea graces this decorative pillow designed by Suzanne Nicoll. Hydrangeas are lucky because they typically can grow throughout three seasons, early spring through late fall; so feel free to show off your pillow all year long for a refreshing floral accent. Our Hydrangea Pillow has shades of purple and blue which show off the detail within the hooking technique used. A dragonfly flies near by the bold green leaves of the hydrangea. –>Be sure to click on the links for these well-crafted pillows to get a close up look at their detail, with our new zoom feature. Both of the pillows featured here are new for the summer 2012 catalog and are exclusive items for Sturbridge Yankee Workshop. In the textile and weaving factories of the early 19th century, there were flickers of creativity that sprouted crafting ideas as a way of using the waste from the mills. The workers of these factories were allowed to take some of the leftover textile materials home. They then would use them to pull the various fibers though a backing; creating what is now called “hooked fabric.” Details of exactly where the technique of hooking fabric truly originated are a little vague but there is also evidence in early Scotland and parts of France. In these countries, instead of cotton materials, rags were actually used and pulled though in the same manner. Nowadays, we see two forms of hooking styles that typically utilize wool. Fine hooking, which uses a thinner strip of wool, will produce more intricate details. Primitive hooking, using wider strips of wool, accomplishes shading and highlights that are seen in the more visible textures of the wool. Most of the hooking today is done with a solid backing, in order to keep it from pulling or losing its strength in the years to come.